Download "Insurance in Private Practice March 2015"
2 Important information AMA Queensland Insurance Solutions is a trading name of KSLR Pty Ltd, a Corporate Authorised Representative of Insurance Advisernet Australia Pty Limited, AFSL Corporate Authorised Representative No: Chris Mariani, Authorised Representative No GENERAL ADVICE WARNING The information provided in this presentation is of a general nature and does not take into account your objectives, financial situation or need. Please refer to the relevant Product Disclosure Statement before purchasing any insurance product. 3 Workers Compensation Business Package Medical Indemnity Medical Doctor Indemnity Entity/Staff Management Liability Cyber Risks Policy Grouping key risks: 1. 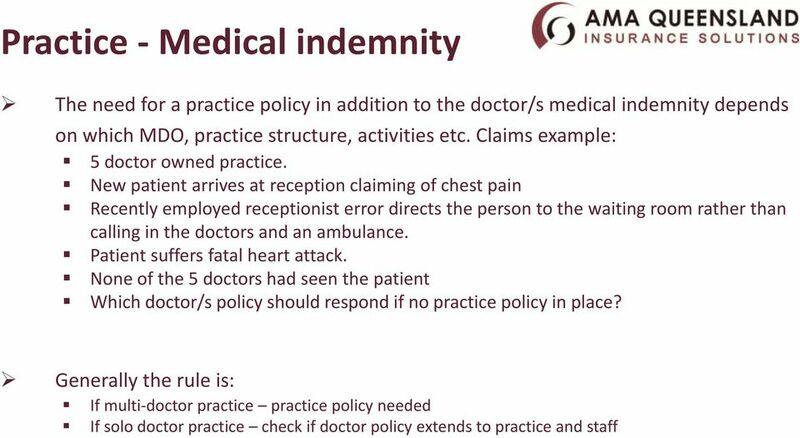 Medical negligence (doctor and practice/staff) Civil claims against Doctors Civil claims against practice entity and/or practice staff Related medico risks i.e. medical board investigations, coronial, medicare audits etc. 2. Practice Premises risks Patient & visitor slips/trips (public liability) Physical loss or damage to premises, fit-out, equipment, glass etc. 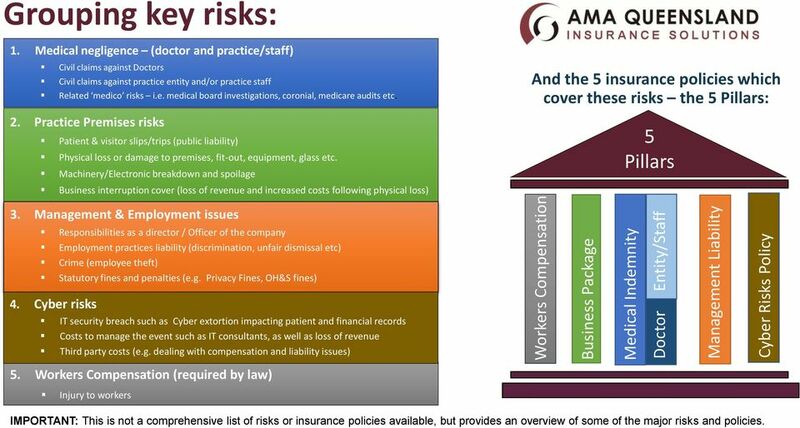 Machinery/Electronic breakdown and spoilage Business interruption cover (loss of revenue and increased costs following physical loss) And the 5 insurance policies which cover these risks the 5 Pillars: 5 Pillars 3. Management & Employment issues Responsibilities as a director / Officer of the company Employment practices liability (discrimination, unfair dismissal etc) Crime (employee theft) Statutory fines and penalties (e.g. Privacy Fines, OH&S fines) 4. 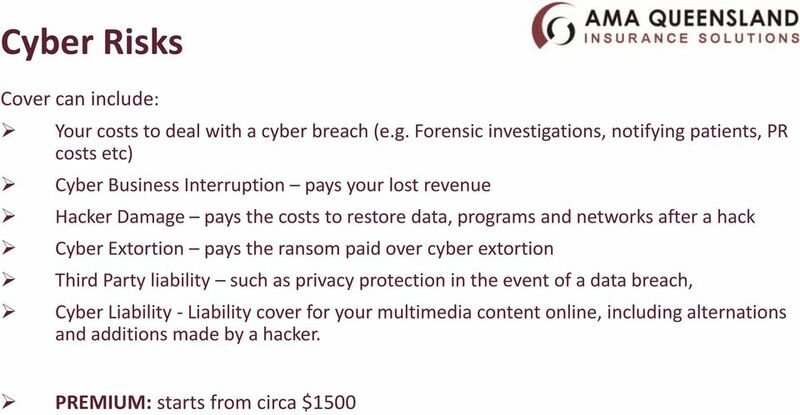 Cyber risks IT security breach such as Cyber extortion impacting patient and financial records Costs to manage the event such as IT consultants, as well as loss of revenue Third party costs (e.g. dealing with compensation and liability issues) 5. Workers Compensation (required by law) Injury to workers IMPORTANT: This is not a comprehensive list of risks or insurance policies available, but provides an overview of some of the major risks and policies. 6 Business Package Package of covers with main sections: Property Fire and perils cover Business interruption Usually insure gross income Glass cover: Replacement value Electronic/Machinery B down: Repair/replacement cost Public Liability: Injury to third parties Premiums depend on amount to be insured, quality of building, security. template If you re considering establishing or purchasing a small business, it s important that you have a Business Plan. This plan will help provide you with an essential road map for your new business. The Towergate Interim Manager guide to insurance programmes Interimwomen.com is a trading name of Russam GMS Ltd which is an Introducer Appointed Representative of Towergate Underwriting Group Limited. CHANGES IN THE RISK. If yes, what is the new name? If yes, what has changed? If yes, what has changed? If yes, how has it changed? Motor Trades Pack. Finely tuned insurance for Motor Trades. Motor Trades Pack Finely tuned insurance for Motor Trades. Our expertise in insurance supports you and your clients. Flexibility and value for money is the key to satisfying the needs of your clients. Incisive Business Guide to Business Insurance Business Insurance Guide Summary This guide from Incisive Business outlines the features and benefits for your business from taking out business insurance.